Happy Monday all! 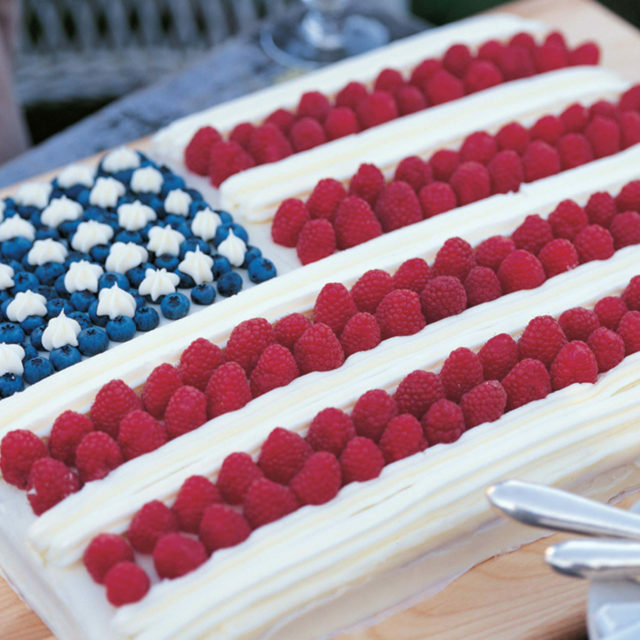 With July 4th just two days away, I wanted to post one of my favorite and festive desserts in honor of the holiday, as well as a couple of cute outfit ideas for watching the fireworks. I can’t say enough fabulous things about this cake courtesy of chef and hostess extraordinaire, Ina Garten. The bejeweled berry design is such a show stopper and the combination of the airy cake, creamy icing and fresh berries is absolutely delicious. Ina has done it yet again! You could easily make and decorate this dessert the day before and serve it on the 4th, or make it for any summer party. I actually baked this cake a couple of weeks ago for some close friends, and both the kids and adults enjoyed every last bite. Yum! As for Independence Day attire, because it’s always fun to dress in patriotic colors on this special day, I love this dress and these sandals for casual look, as well as these jeans and this top would be darling for evening. This bathing suit would be cute for the 4th too, especially paired with some fun sunglasses and denim shorts. I hope everyone has a safe and happy 4th of July! Heat the oven to 350 degrees. Butter and flour a rectangular cake pan. Cream the butter and sugar in the bowl of an electric mixer fitted with the paddle attachment on high-speed, until light and fluffy. Lower the speed to medium, and add the eggs, one at a time. Next, add then add the sour cream and vanilla. Be sure to scrape down the sides of the bowl and stir the batter until smooth. Sift together the flour, cornstarch, salt, and baking soda in a bowl. Turn the mixer to low-speed, and add the flour mixture to until just combined. Try not to over mix! Pour the batter into the buttered pan, and smooth the top with a spatula. Bake the cake for 20 to 30 minutes, or until a toothpick comes out clean. Cool the cake to room temperature. For the icing, mix until smooth the butter, cream cheese, sugar, and vanilla in the bowl of an electric mixer fitted with the paddle attachment. Spread three-fourths of the icing on the top of the cooled sheet cake. Fill the upper left corner with blueberries (to resemble a flag). Place 2 rows of raspberries across the top of the cake like a red stripe, and put the remaining icing in a pastry bag fitted with a star tip (or you can make your own pastry bag by using a large ziplock bag and cutting the tip) and pipe two rows of white stripes below the raspberries. Alternate rows of raspberries and icing until the flag is finished.